Just a few more rounds— the foot now measures 5 inches. Then, a bit more color work—about 3/4th of an inch, then the colors reverse, and another 3/4th of an inch more, before the toe. I'd rather have the foot portion a bit too long, and have to make the toe shaping shorter (more rapid) to fit than have a sock that is too short. And then—they are done! Fast work--I might just finish them tonight, or not, but certainly before the end of the week. Fun work. I don't always like the fit of stranded color work socks in my shoes—but one by product of losing weight is my feet are smaller too, and some shoes are too loose. A nice thick stranded color work sock will be just the thing to make the shoes fit again. So its a good thing to have a few pairs planned, right? Though if we continue to have winters as mild as this past winter I won't have need of thick warm socks. I could have knit more, and started the color patterning last night—but I know that I just don't think as well when I am tired. It's s better to wait and start the patterning early in the day or evening—Then it always works out. I can't tell you how many times I've tried to rush ahead—only to find my self tinking a round or two because I messed up. So to keep busy, I cast on for a cowl—Yes, as winter comes to end, (and I haven't worn any of the cowls I knit last winter) I cast on for another cowl. 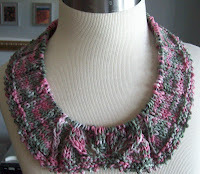 It's a pretty skein—just a single one—of a hand painted yarn. Just the thing for a cowl. It's supersized right now, but the plan (already evident) is to shape it with decreases --either side of the central leaf motif. It will end up wide (and easy to pull down low) at the bottom, and snugger at the top. The body of the cowl is broad ribs--(6 X 2) and a center front leaf motif. Eventually it will also have a solid pink rose, as the perfect finish. Next week (next month!) 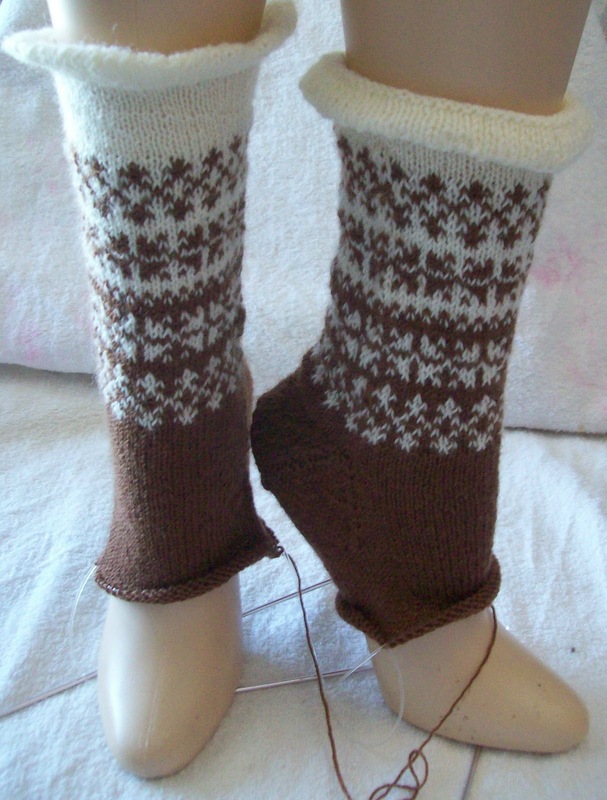 it will be time to knit the ski cap, and to start yet another pair of socks—but secret socks. They will be the fourth pair of secret socks, and eighth pair of socks I have knit this year. Even I am slightly amazed at that!